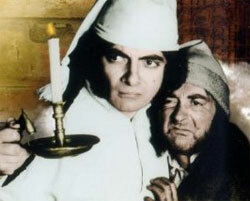 In this version, Ebenezer Blackadder is not the miser of the Dickens story. This time, he is actually the nicest man in all of Victorian England, who gives nearly everything he has away at Christmas. As a reward for all of his good work, a ghost shows him how awful his ancestors were in the form of clips from previous seasons of Blackadder. The problem is the more Ebenezer sees, the more he thinks that being a terrible person would work in his favor. Finally, he is shown the future, where Blackadder is shown as being the lowest scum in the futuristic universe. By the end, the story has been put completely on its head and Blackadder starts treating everyone as mean possible on Christmas, and ends up insulting most of the characters, including two very important members of the Royals. What I love about Blackadder’s Christmas Carol is that since its main character has always been a scheming backstabber, why should the Christmas episode show him being all lovey-dovey? If you’re a fan of British comedy, this is a must-see episode. And if you’re tired of the same old saccharine specials, this is a good escape when you’ve had you’re fill of goodwill towards men. And how many other specials have a punch in the face being given like a present?